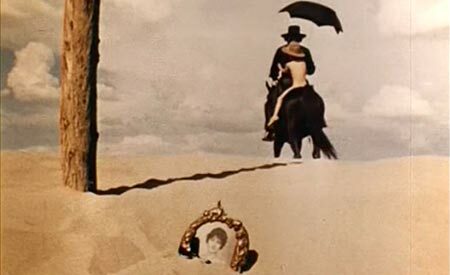 The back story behind the cult of El Topo is as interesting as the film itself, although this Mexican western is a curiosity that is hard to explain, or for that matter, hard to fully understand. A weird mix of ultra-violent western with Eastern religious symbolism and obsessive fixation with the odd and unusual, Alejandro Jodorowsky’s film is not for those who like their stories laid out on a plate and for all it’s strangeness, it is hypnotic. 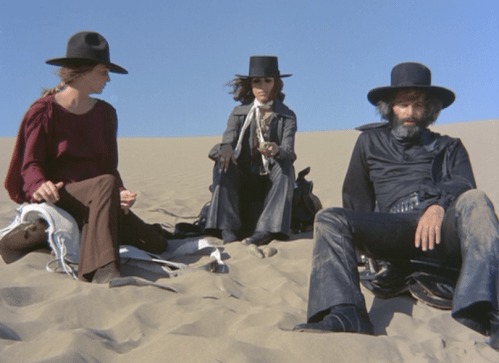 El Topo, a gunfighter dressed in black, arrives with a small naked boy, to a town that has seen a massacre. Taking on the role of avenging angel, he rides off to find the culprits, discovering the bandits living with a odd Colonel and his woman. El Topo disposes of them, leaves the boy in the hands of a group of monks and rides off with the girl, who he called Mara. She convinces him to head into the desert to find four Master gunslingers and to take them on. Being followed by a mysterious woman, he tracks each Master down and after listening to their philosophies, takes them on to a fight to the death. Left abandoned, the story takes a turn when El Topo finds himself in a cave with an assortment of disabled people left there by the local town folks who follow a unusual cult. El Topo and his new girlfriend decide to raise money for dynamite to help the trapped people escape from their cave coffin. To say that this is an odd film is a massive understatement. Split into two halves, the first is like a drug-fueled Sergio Leone spaghetti western. Dripping, quite literally, with blood, it’s high levels of violence is shocking yet it somehow seems to sit fine with a film that is obviously heavily religious. Jodorowsky’s use of religious symbolism is everywhere, from the fact that El Topo (or translated, The Mole) considers himself to being God, to having the film in chapters and using titles from the Bible. The symbolic elements don’t necessarily work and they do seem misplaced and garbled. The second half comes at you like a demented Frederico Fellini film, all weird characters doing weird things. The least successful of the two parts, it doesn’t mean you can draw yourself away from the visuals that Jodorwsky has produced. This is a striking film. It is beautiful to look at and the cinematography is perfect. It doesn’t have the roughness of an underground movie, which this most certainly become. The first midnight movie, it was championed by John Lennon and Yoko Ono, who encouraged The Beatles manager, Allen Klein, to buy the rights. It was shown at the legendary The Elgin cinema, where it ran continuously from December 1970 through to July 1971, at midnight, seven days a week. It has influenced many film makers and pop stars. Peter Gabriel is quoted as saying that the film was the influence behind Genesis’ album The Lamb Lies Down On Broadway. So what is the fuss? It doesn’t follow any conventional film styles or narrative and a lot of the action is sometimes unexplained, as if scenes have been left out. It’s a story about redemption, philosophy, religion and being an outsider, you can understand how this became popular with the early 70s crowd, heavily drawn in on LSD and other drugs. It’s like a two hour hallucination filled with bloody shoot-outs, naked women and deep speeches. It is sometimes uncomfortable to watch and other times you cannot pull yourself away. Could I make an sense of it? No but then again I don’t think many people could. Did I enjoy it? Hard to say. I don’t think it’s a film you can enjoy in the traditional sense. It’s a film that has a great deal of merit and after hearing so much about it I am glad I finally saw it, in its original language. Would I see it again? Probably not for a long time. Or unless a group of highly intellectual individuals invite me to see it with them so I can sit and listen to them debate it. Then i might be tempted.